The Raspberry Pi is actually a tiny bare-bones computer motherboard. It doesn't come with a hard drive or even a case. It has a RCA video port which can be connected to your TV, USB port for a keyboard, USB port for a mouse, and the model B even has an Ethernet port. It uses a Broadcom 700Mhz BCM2835 System-On Chip and Boots from SD card running a lightweight Remix of Fedora Linux for ARM. You can set up the Raspberry Pi as a desktop PC to do spreadsheets, word-processing, internet browsing, but one of its best features is the row of GPIO (general purpose input⁄output) pins along the edge of the board, which you can program to work like a microcontroller to monitor input from a switch or sensor, and to control devices that are attached to it, or even to sending a signal or data to another device. 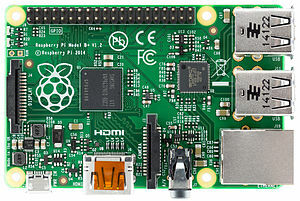 The Raspberry Pi uses the Broadcom SoC (system-on-Chip). 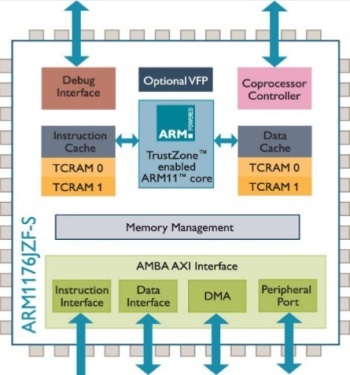 Basically Broadcom's SoC, integrates an 32-bit ARM1176 processor core (manufactured by the British semiconductor company ARM) with a GPU (Graphics Processor Unit) a certain amount of RAM, and some I/O circuitry. The Model B+ Raspberry Pi featured a Broadcom BCM2835 chip, with a single 700MHz ARM1176JZF-S core and either 256MB or 512MB of RAM. The new Raspberry Pi 2 Model B+ uses Broadcom's BCM2836, which contains four 32-bit ARMv7 Cortex-A7 cores and 1GB of RAM. To program the Raspberry Pi you need to install the free Raspbian Linux NOOBS package, which contains the GNU Compiler Collection (GCC) which supports programming in C, C++ and assembly language. Use the Linux command line interface with one of two command line text editors: nano or vi to enter and edit the assembly source code. 1. Create a file called filename.s (s for source code), enter your assembly code, then save it.